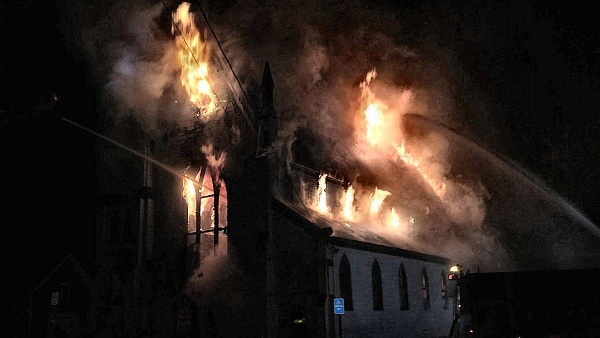 A 3-Alarm fire ravaged the First Baptist Church on School Street in Lebanon last night. The fire was immediately called a 3-Alarm upon Lebanon Fire Department’s arrival shortly before 11:30 pm. Several area residents were evacuated to the Methodist Church in fear that the church’s steeple was about to collapse. Staging was set up on Green and Elm Street while fire companies from Vermont and New Hampshire helped battle the blaze. Liberty Utilities was called to shut off electricity in the area in addition to the Red Cross to help with the evacuees and for aid to fire fighters. The NH Fire Marshall’s office was called in to determine the cause of the fire. We will keep you updated as more information comes in.